The Kelp Forest Exhibit from the Monterey Bay Aquarium demonstrates what students can accomplish together using VRML and X3D. The Kelp Forest Exhibit is a large student-produced project that illustrates how X3D can build and integrate a large collection of individual Web-based models. 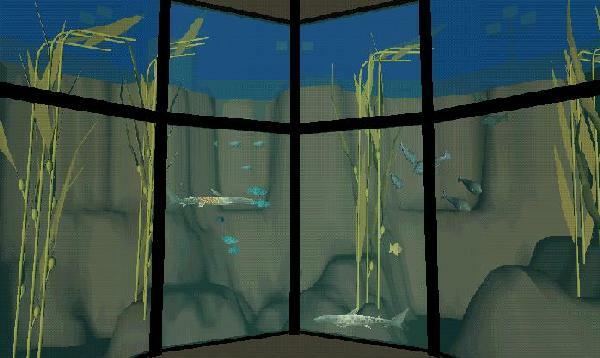 The overall scene that integrates all these individual X3D models is Kelp Forest Main. The paper Teaching 3D Modeling and Simulation: Virtual Kelp Forest Case Study describes how this group effort was accomplished. Comprehensive modeling efforts such as the Kelp Forest Exhibit provide an excellent way to organize course work and student projects. Black Surf Perch Create a new fish type through configuration of the CircleFishLod prototype. Blue Rock Fish Create a new fish type through configuration of the CircleFishLod prototype. Changing Fog A Fog node that adjusts as the viewer's orientation and position changes. This is a good candidate to become a Prototype since Fog does not automatically bind when inlined. Circle Fish Lod Example This is a circle fish using the CircleFishLod prototype. Circle Fish Prototype This is a prototype for a CircleFish, which is also used by CircleFishLod. Default fish size: length is 1 m (Y-axis), max Height is 1 m (Z-axis), max Width is 10 cm (X-axis). Copper Rock Fish Placard Viewer Viewer for tank placards - needs photo on one side, placard on other, and conversion into prototype once ready. Fish One simple Fish with three levels of detail. Fish Examples Example instances of the Fish prototype. Fish Model Comparison This file compares all of the fish prototypes. Fish Prototype This is a reusable prototype of a generic fish, which can be configured upon instancing to create customized fish. Garibaldi Instancing a prototype to match a specific fish. Half Moon Group This is a group of HalfMoon fish implemented as ProtoInstances. Half Moon Prototype Prototype for a group of HalfMoon fish in the Kelp forest. Introduction Message Welcome text message (positioned high and low) that introduces visitor to Kelp Forest Exhibit upon initial entry - zoom camera back beyond 40m range to make this text visible. Kelp Bass Kelp bass is a type of fish. Kelp Bulb One leaf of Kelp moving around a Bulb. Cycle time is 11 seconds, which is twice the cycle time of tank surface motion. Kelp Examples No Base Creates 3 instances of Kelp that sway. Kelp Flexible Stipe An extruded piece of kelp for the Kelp Forest project. Bulb is separate. Kelp Forest Main This is the main entry to the Kelp Forest that loads all of the other components as Inline scenes. Kelp Forest No Nancy This is the main entry to the Kelp Forest that loads all of the other components as Inline scenes. Kelp Prototype Creates Kelp Prototype - this file uses Bulb and is used by KelpExamplesNoBase. Kelp Surf Perch Create a new fish type through configuration of the CircleFishLod prototype. Kelp Tank Kelp Forest Tank at the Monterey Bay Aquarium. Kelp Tank External Light Topside light for Kelp Forest Exhibit. Kelp Tank External Lights Topside lights which illuminate the Kelp Forest Exhibit at night. Kelp Tank Water Surface Moving water surface for KelpTank - initial view is perpendicular, rotate viewpoint up to see motion. Cycle time is 5.5 seconds to match pump, with slight time lag to indicate inertia of quasi-steady-state equilibrium..
Pump House Positive-displacement cylinder pump to emulate breakers surge, designed and built by David Packard. Rock Floor Rock-like floor and walls of kelp forest exhibit, modeled to scale. Rubber Lip Group A group of RubberLip fish, instanced using the CircleFish prototype. Sardine One Sardine, three levels of detail. Sardine X Individual Sardine for use in the Sardine School. Sea Star High Resolution Example Example instance of a SeaStar high-resolution prototype using default settings. Sea Star High Resolution Prototype High-resolution model of a seastar, created in Maya 4 and exposed as a prototype for further reuse. Sea Star Prototype Prototype of a simple SeaStar. Zoom in to inspect. Sea Star Simple A simple sea star constructed out of scaled Sphere primitives. Shark Lefty Lefty Shark, who has the red/gold NPS logo because he is proud of being a Marine animal. Shark Lucy Lucy Shark is a tour guide for the Kelp Forest exhibit. Striped Surf Perch Create a new fish type through configuration of the CircleFishLod prototype. Striped Surf Perch Plaque One fish plaque with lithograph on one side and actual picture on the back. Click on plaque to go to picture or click on buttons to change picture. Tree Fish Plaque One fish plaque with lithograph on one side and actual picture on the back. Click on plaque to go to picture or click on buttons to change picture.